The purpose of this bench-to-bedside review is to summarize the literature relating to complement activation in sepsis and other critical illnesses and the role of C1-esterase inhibitor (C1 INH) as a potential therapy. The complement system is a crucial part of the body's defense mechanism against bacterial infection and is vital for protecting individuals against any disturbance of homeostasis associated with the appearance of foreign antigens . Activation of the complement system can be initiated through the classic pathway antigen-antibody complexes or through the alternative and lectin pathways by non-immunologic molecules such as endotoxin (Figure 1). The complement system orchestrates the immunologic network and links to elements of both innate and adaptive immunity and is an important inducer of an excessive inflammatory host response and contributes to the clinical course, prognosis, and complications of sepsis [2, 3]. Complement is activated early in sepsis (especially clinical sepsis) [4, 5] and other conditions involving inflammation or immunologic alterations [6–8]. Bradykinin, complement factors, contact system components, estrogen, protease deficiencies, and genetic polymorphisms are also implicated in certain types of non-allergic angioedema, including hereditary and drug-induced . 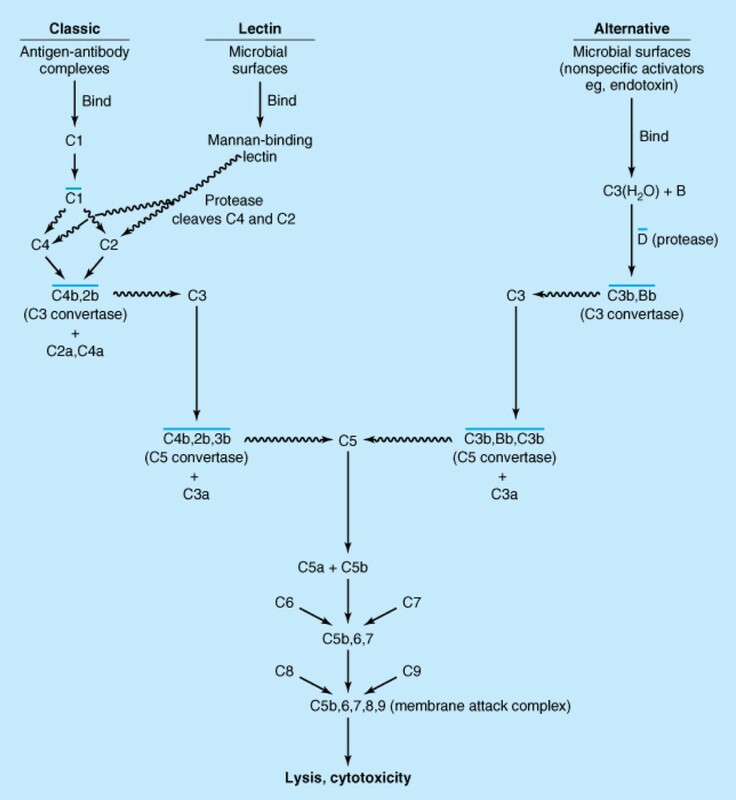 The classic and alternative pathways of the complement system. The squiggly line arrows indicate that proteolytic cleavage of the molecule at the tip of the arrow has occurred; a line over a complex indicates that it is enzymatically active. Note that the nomenclature of the cleavage products of C2 is undecided. Some call the large fragment C2a and others call it C2b. Here, all small fragments are labeled 'a' and all large fragments are labeled 'b'. Hence, the C3 convertase is depicted as C4b,2b. Note that proteases associated with the mannose-binding lectin cleave C4 as well as C2. Reprinted with permission from McGraw-Hill Medical . C1-esterase inhibitor (C1 INH) is an alpha-globulin controlling the first part of the classic complement pathway and is a natural inhibitor of complement and contact system proteases  and a major downregulator of inflammatory processes in blood  (Table 1). C1 is the primary regulator of the plasma kallikrein-kinin system as evidenced by a lack of kallikrein inhibitory capability in plasma taken from patients with hereditary angioedema  and can also inactivate other proteases, including plasmin and tissue plasminogen activator, although the in vivo significance remains unclear . During sepsis, an overactive complement system may compromise the effectiveness of innate immunity [5, 13]. Reprinted with permission from Elsevier . Other activities of C1 include interactions with endogenous proteins, with cells, and with infectious agents . In addition to binding to endotoxin from Gram-negative bacteria, C1 may bind to streptococcal lipoteichoic acid . These may have potentially important functional consequences that are not dependent on protease inhibition. Activation of the complement cascade can be triggered via the alternative complement pathway and the mannose-binding lectin pathway. When these converge with the classic complement pathway (Figure 1), the C3-convertase is formed. This cleaves C3 into C3a and the opsonizing C3b, which contributes to the formation of C5-convertase . C5-convertase subsequently cleaves C5 into the anaphylatoxin C5a and C5b, thereby initiating formation of the terminal membrane attack complex, consisting of C5b and C6-9 . In sepsis, complement system activation is evidenced by the presence of the complement activation products C3a, C5a, and C5b-9 in plasma . These anaphylatoxins have a spectrum of proinflammatory activities . In addition, there is a loss of C5a receptors (C5aRs) on blood polymorphonuclear neutrophils (PMNs) in patients with septic shock . When C5a interacts with blood PMNs, signalling path-ways are paralyzed. This paralysis results in the loss of their innate immune function and likely contributes to the harmful consequences of sepsis . Complement C5a has also been implicated in the pathogenesis of septic cardiac dysfunction . Complement may interact with other systems in sepsis. This has been comprehensively reviewed by Rittirsch and colleagues . For example, it has been linked to the coagulation pathway which, when activated during sepsis, may predispose to thrombosis and disseminated intra-vascular coagulation . The resulting generation of thrombin will aggravate the excessive inflammatory response and further complement system activation and may be involved in the increased rate of apoptosis of lymphocytes and splenocytes, causing a marked decrease in cell numbers and resulting immunoparesis. Paradoxically, the apoptosis of macrophages and neutrophils seems to be unaffected or even delayed. Complement may also interact with the autonomic nervous system, which is also dysregulated in sepsis. Further investigations are needed to establish the significance of these various interactions and the identification of new therapeutic targets. As stated above, the biological activities of C1 INH include the inactivation of a variety of proteases, including complement system proteases (C1r, C1 s, and MASP2), contact system proteases (factor XII, plasma, and kallikrein), intrinsic coagulation proteases (factor XI), and fibrinolytic proteases (plasmin and tissue plasminogen activator) (Table 1) . In addition to inhibiting proteases, C1 INH interacts with extracellular matrix components, the complement component C3, endothelial cells and leukocytes, and endotoxin. C1 INH is licensed in Europe and the US for the management of hereditary angioedema (including acute attacks and routine prophylaxis). In addition, over the past 20 years, administration of C1 INH has been associated with improved survival or correction (or both) of biochemical parameters in a variety of clinical scenarios. However, these have been predominantly lab-based studies; human investigations have been mainly at the level of individual anecdote, small case series, or small randomized controlled trials. Table 2 summarizes the research and clinical studies included in the present review. Leukocyte sticking to the endothelial wall in post-sinusoidal venules was reduced in C1 INH rats. Hepatic microcirculatory disturbances may be reduced by C1 INH. C1 INH did not prevent the hemodynamic/hematologic changes. Activation of fibrinolysis and development of intravascular coagulation were unaffected. C1 INH reduced decreases in plasma levels of factor XII and prekallikrein and abrogated the systemic appearance of C4b/c and reduced elaboration of various cytokines. C1 INH blocked LPS-binding protein-dependent binding and suppressed LPS-induced TNF-a mRNA expression. C1 INH enhanced the bactericidal activity of blood neutrophils and peritoneal exudate leukocytes. Survival increased with C1 INH. Decrease in arterial oxygenation was attenuated by pre-treatment with C1 INH. Tissue oxygenation decreased in LPS and C1 INH groups without significant difference after 120 minutes of endotoxemia. Endotoxin-induced tissue hypoxia of the intestinal mucosa was not prevented by C1 INH. C1 INH reduced endotoxemia (9.5%) and attenuated intestinal leukocyte adherence in submucosal venules (35%) and mesenteric plasma extravasation (44%). C1 INH diminished changes in the intestinal microcirculation. C3- and C4-deficient mice were significantly more sensitive to endotoxin. C1 INH had a protective Effect against endotoxin. C1 INH prevented hypoxemia. C1 INH improved recovery of cardiac contractility and preservation of coronary vascular endothelial function. C1 INH improved recovery of cardiac contractility and preservation of coronary vascular endothelial function. C1 INH attenuated myocardial injury and neutrophil infiltration even after 48 hours of reperfusion. C1 INH suppressed C3 mRNA expression and protein synthesis and prevented myocardial cell injury. C1 INH improved cardiac function and hemodynamics and reduced myocardial infarct size. C1 INH reduced intestinal tissue injury and attenuated leukocyte infiltration and improved survival. C1 INH slightly ameliorated the degree of histological alterations, but increase in serum amylase was reduced in diet-induced pancreatitis only. C1 INH did not improve survival in taurocholate- and diet-induced pancreatitis. C1 INH inhibited C1 activation. Survival improved. C1 INH inhibited complement activation, and no contact activation was found. Leukocytes and platelet activation were reduced by C1 INH. C1 INH attenuated hyperacute rejection by decreasing the activation of adhesion molecules. C1 INH at 10 U/mL prolonged survival time and diminished complement activation but did not prevent rapid lung injury. C1 INH improved pulmonary function but not survival. C1 INH therapy with standard immunosuppressive regimen prevented rejection but did not improve survival. C1 INH reduced complement activation and improved clinical outcome. C1 INH increased bacterial clearance. C1 INH may attenuate complement and contact activation. C1 INH increased plasma C1 INH antigen and activity levels during days 1 to 4 and lowered serum creatinine concentrations on days 3 and 4. Organ failure was less pronounced. Mortality was unaffected. Elastase-alpha(1)-antitrypsin complex and lactoferrin levels were reduced. Complement activity was inhibited, and survival was improved. There was no difference in functional C1 INH levels between treatment group and controls. C1 INH restored myocardial function. 48-hour infusion of C1 INH was safe and inhibited complement activation. Complement activity was reduced. There was no Effect on mortality. In C1 INH patients, plasma levels of C5a and C4 d and fluid levels were normalized. In case 1, pleural effusions were reduced within 12 hours, leading to normal graft function within 4 days. In case 2, pleural effusions were reduced from 19 L per day to 300 mL within 3 days of treatment. C1 INH, C1-esterase inhibitor; CABG, coronary artery bypass grafting; LPS, lipopolysaccharide; RCT, randomized controlled trial; TNF-α, tumor necrosis factor-alpha. C1 INH improves outcomes in animal models of sepsis. Croner and colleagues  reported a reduction in hepatic leukocyte-endothelial interactions in post-sinusoidal venules and an improved hepatic perfusion in lipopolysaccharide-induced sepsis in rats. Decreased leukocyte adherence and suppression of the increase in vascular permeability were also demonstrated in both rats and mice treated with C1 INH [19, 20]. Fischer and colleagues  reported improved survival in C3-defi-cient mice challenged with endotoxin and also demonstrated the role of complement in endotoxin clearance. In a rabbit model, combined anti-thrombin and C1 INH treatment during early endotoxic shock decreased organ fibrin deposition and improved cardiovascular stability . Treatment with C1 INH also prevented the hypoxemia induced by endotoxic shock in dogs  and decreased cytokine production in both primates  and mice . In a cecal ligation and puncture (CLP) models of sepsis, treatment with a single dose of C1 INH improved survival . This improvement was enhanced by the administration of multiple doses. However, survival was not improved with a single dose at 6 hours rather than immediately after puncture but was improved when two doses were given at 3 and 9 hours after CLP. This finding led to the suggestion that the effectiveness of C1 INH treatment in sepsis may relate, at least in part, to its ability to enhance phagocytosis rather than inhibit the complement and contact systems. Animal studies have shown that administration of C1 INH at or just prior to reperfusion results in a reduction in myocardial injury; reduced plasma levels of creatine kinase, troponin T, C3a, and C5a; and suppression of the endothelial expression of P-selectin and ICAM-1 (inter-cellular adhesion molecule-1) [27–30]. C1 INH also sup-pressed ischemia-reperfusion-induced apoptosis in rat myocardial cells with a possible effect on myocardial C3 expression [31, 32]. Beneficial effects of C1 INH have also been described in a number of other animal ischemia-reperfusion models, including skeletal muscle, liver, cerebral artery, and mesenteric artery occlusion. These studies were reviewed in detail by Davis and colleagues . More recently, C1 INH treatment reduced intestinal tissue injury, attenuated leukocyte infiltration, and improved survival in a murine model of intestinal ischemia-reperfusion injury . The authors proposed that C1 INH may play a direct role in the suppression of leukocyte transmigration into reperfused tissue. Complement and kinin pathways are also activated in acute pancreatitis . C1 INH treatment ameliorated the degree of histological alterations in animal models of acute pancreatitis but did not improve survival . Murine models demonstrate that C5a exerts an anti-inflammatory effect in pancreatitis , but, to date, there is only limited evidence for the use of C1 INH in acute pancreatitis . Antibody-mediated complement activation is implicated in transplant rejection [8, 37]. C1 INH inhibited the action of porcine aortic cells incubated with human serum  and improved perfusion and survival of pig kidneys . C1 INH has also been reported to provide some protection against injury in ex vivo mouse lung or pig lung whole human blood models [40–42]. C1 INH has also suppressed hyperacute and acute vascular rejection in porcine models [43, 44]. Thermal injury is associated with profound immunologic alterations and activation of the complement system . This association may play an important role in the development of capillary leak syndrome and inflammatory tissue destruction. In a porcine model, C1 INH treatment reduced complement activation by 50% and reduced edema formation . These data suggest that C1 INH therapy may have a potential therapeutic role in the management of burn injury. Complement-mediated opsonic activity may appear in the cerebrospinal fluid of patients who recover completely from bacterial meningitis and may influence the outcome of the disease . In a rat model of meningitis, treatment with C1 INH was associated with reduced clinical severity, a less pronounced inflammatory infiltrate around the meninges, and lower brain levels of proinflammatory cytokines and chemokines. C1 INH treatment also increased bacterial clearance, possibly through an upregulation of CR3 . These data suggest that C1 INH may be a useful agent in the treatment of pneumococcal meningitis. However, further clinical studies are needed in light of data from clinical studies of the monoclonal antibody eculizumab (that binds with high affinity to the complement protein C5) suggesting an increased risk of sepsis necessitating meningococcal vaccination 2 weeks prior to treatment . There are limited clinical data on the use of C1 INH in human sepsis. Early studies in small numbers of patients with septic shock reported that C1 INH treatment suppressed activation of the complement and contact systems [49, 50]. These investigators then performed a double-blind study in 40 patients with severe sepsis or septic shock . C1 INH was infused intravenously over the course of an hour, starting with 6,000 IU, followed by 3,000, 2,000, and 1,000 IU at 12-hour intervals. Patients treated with C1 INH had less severe multiple organ dysfunction and improved renal function, but there was no difference in mortality compared with the control group. The same group also reported that C1 INH reduced circulating elastase-α1-antitrypsin complex levels as well as complement activation and interleukin-8 release . As neutrophils may contribute to the development of organ dysfunction during sepsis, the reduction in neutrophil count after C1 INH treatment may account in part for its favorable effect. A positive effect on mortality and an inhibitory effect of C1 INH (dose of 12,000 IU) on complement was also reported in an open-label Russian study of patients with sepsis . In a recently published study, Tapisiz and colleagues  measured levels of C1 INH in 18 newborns who had had neonatal sepsis and who were blood culture-positive. These levels were repeated 48 hours later and compared against 23 healthy controls of the same gestational age. The authors reported no difference between the two groups and no difference in edema formation and concluded that, in neonates, other factors are responsible for vascular leak and edema . Bauernschmitt and colleagues  reported on the use of C1 INH as salvage therapy in three patients following emergency surgical revascularization after failed percutaneous transluminal coronary angioplasty. Initially, a 2,000-unit bolus of C1 INH was administered, followed by 1,000 units at 12 and 24 hours after surgery. The authors reported rapid hemodynamic stabilization of all three patients. C1 INH therapy instituted after thrombolytic therapy was reported by de Zwaan and colleagues  to diminish complement activation and reduce troponin T and creatine kinase levels in patients with myocardial infarction by 36% and 57%, respectively (P = 0.001). In a double-blind study of 57 patients undergoing emergency coronary artery bypass surgery, Thielmann and colleagues  also reported a reduction in cardiac troponin levels in the subgroup of patients treated with C1 INH before 6 hours. The cardioprotective effects of C1 INH in ST segment elevation myocardial infarction in 80 patients undergoing emergent reperfusion with coronary artery bypass grafting were investigated in an Italian double-blind study . The authors reported statistically significant differences between the C1 INH-treated patients and controls for cardiopulmonary bypass support (P = 0.04), administration of high-dose inotropes (P = 0.001), time to intubation (P = 0.03), and intensive care and hospital lengths of stay (P = 0.04 and 0.03, respectively). Stroke volume (P = 0.03) and cardiac index (P = 0.02) were also significantly improved in the C1 INH group. Nurnberger and colleagues  reported on the use of C1 INH in 15 patients with severe capillary leakage syndrome. Cumulative dosage was 180 units/kg body weight (initial dose: 60 units/kg followed by two doses at 30 units/kg and four doses at 15 units/kg every 12 hours). One year after bone marrow transplantation, the survival rates were 57% in the C1 INH treatment group and 14% in the control group (7 patients not treated with C1 INH) (P = 0.008). After infusion of C1 INH, the plasma levels of C5a and C4 d normalized and the activity of C1 INH rose to 139% ± 10% of normal human plasma (NHP) pool (mean ± standard deviation). Strüber and colleagues  reported the use of high-dose C1 INH given over 2 days in two patients with graft failure either due to reperfusion injury immediately after transplantation or due to an acute rejection 2 months after double-lung transplantation. In both cases of graft failure, a capillary leak syndrome occurred with pleural effusions of from 7 L per day to more than 10 L per day. In one case, the disturbance of gas exchange during severe reperfusion injury could not be treated effectively with other treatment modalities such as nitric oxide ventilation or surfactant administration. With the use of C1 INH, pleural effusions decreased within 12 hours, leading to normal graft function within 4 days. In the second recipient, acute rejection forced the use of extracorporeal membrane oxygenation (ECMO) within 24 hours despite immunosuppressive therapy. After administration of C1 INH, pleural effusions decreased from 19 L per day to 300 mL within 3 days of treatment. ECMO was discontinued after C1 INH treatment and the patient was extubated 2 weeks later . Kowal-Vern and colleagues  reported significant decreases in C1 INH levels (P = 0.0001) in 60 patients with thermal injuries and sepsis on the first day of admission, although this had increased to near-normal levels by day 5. C1 INH is a multifaceted anti-inflammatory protein that exerts its effects through a variety of mechanisms that may or may not depend on protease inhibition via covalent bonding  or other non-covalent interactions with proteins, cell surfaces, or lipids. C1 INH binds to a variety of extracellular matrix components, including type IV collagen, laminin, entactin, and fibrinogen. A non-covalent interaction with C3b inhibits formation of the alternative pathway C3 convertase, whereas an interaction with E and P selectins on endothelial cells is mediated by the Lewis(x) tetrasaccharides expressed on C1 INH. These interactions result in suppression of leukocyte rolling and transmigration. A fourth interaction is the binding of C1 INH to Gram-negative bacterial endotoxin and this results in suppression of endotoxic shock by interfering with the interaction of endotoxin with its receptor complex on macrophages. Lastly, C1 INH binds directly to Gram-negative bacteria, leading to suppression of the development of sepsis, as demonstrated in the CLP model. It has been suggested that pharmacological inhibition of C5a or C5aR may be protective in sepsis . As discussed above, C1 INHs are currently licensed for routine prophylaxis and treatment of angioedema attacks in adolescents and adults. C1 INHs have also been used for the treatment of RAAS (renin-angiotensin-aldosterone system) blocker-induced angioedema and acquired angioedema. Other therapeutic options for bradykinin-mediated angioedema include inhaled epinephrine, corticosteroids, bradykinin receptor antagonists (icatibant), and the plasma kallikrein inhibitor ecallantide [9, 64, 65]. C1 INHs have been shown to be beneficial not only in sepsis and Gram-negative endotoxic shock but also in vascular leak syndrome, transplant rejection ischemia-reperfusion injury, intestinal ischemia and reperfusion, pancreatitis, and burns. However, serious thrombogenesis has been reported following high-dose use of human C1 INH in neonatal patients undergoing cardiac surgery using an extracorporeal circulation . C1 INHs may also have a role in the treatment of cerebral malaria . Clinical studies and well-designed dose-titrating studies are needed to clarify the levels of C1 INH needed to produce a therapeutic effect and to establish whether treatment with C1 INH has a place in the management of these conditions. Other infections in which the inflammatory response contributes to mortality, such as pneumonia and peritonitis, may also be worthy of examination. Editorial support was provided by Innovative Strategic Communications LLC (Stamford, CT, USA) and was funded by ViroPharma Incorporated. This work was undertaken in part at University College London Hospitals/University College London (UCLH/UCL), which receives a proportion of its funding from the funding scheme of the UK Department of Health's National Institute for Health Research (NIHR) Biomedical Research Centre. This article was funded by an unrestricted educational grant from ViroPharma Incorporated (Exton, PA, USA). AJ has worked as an external consultant for ViroPharma Incorporated. MS and AJ have no non-financial competing interests to declare.